Commemorating 150 years of Mount Carmel Zion United Church of Morriston, 1840-1990. We have enjoyed putting these memories together to mark our sesquicentennial. We would like to thank one and all who have contributed. They are as we remember and we apologize for any errors or omissions. In the early fall of the year 1874, a group of men drove to the general store of Mr. Samuel Falconbridge in Aberfoyle. This was the first move by a group of people, inspired by the Rev. Ephriam Clement from Mountsberg, to organize a congregation of the Methodist Episcopal Church. There was obviously a need for another congregation in the area and it was on November 19, 1876 that the first service of the newly formed congregation was held in the Council Chambers of the Township hall with 15 members present. The new church was on a circuit called Flamborough of the Hamilton district of the Niagara Conference, consisting of six congregations, Bethany, Moffat, Mountsberg, Zion near Carlisle, Bethel and Aberfoyle. The bricks for the church were priced at $82.50 for 11,000 bricks and the laying of these bricks came to $25.00. The Dictator box stove used for heating came to $12.00 and the pipes for the stove were 15 cents each. The total cost of the property and furnishings amounted to the grand total of $625.00. It took tens weeks to build the church and on December 30, 1877, a service of dedication was held in the newly built sanctuary. The oval board with the inscription “Mount Carmel Church” was built by George Stephenson, the wagon maker, for $2.50. It was incorporated in the new church built later on and is still there today. 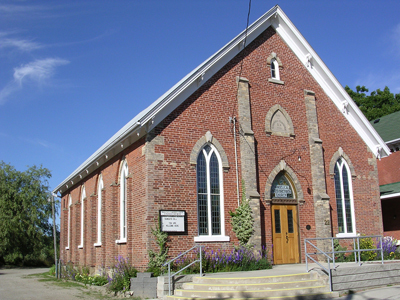 After Church Union in 1925, the Aberfoyle Church became a member of the United Church of Canada and according to the basis of Union, the congregation formed their first Official Board of stewards and elders. Over the years the congregation increased from 70 members to 81 and it became clear that more room was needed for Sunday School and mid-week activities. When putting a basement under the existing basement proved impossible, the decision was made to tear down the old church and build a new one. It was a pleasant summer day in July 1927 that the corner stone for the new building was laid by Mrs. John Kennedy of Chalmers United Church, Guelph. The silver trowel used on that occasion was given to the Aberfoyle congregation as a keepsake and is with the congregation at Morriston. On October 20, 1936, on the sixtieth anniversary of the charge, the mortgage for the new church was burned, just nine years after its building. Since 1876, Aberfoyle has seen and has been part of many changes. After being in the circuit of Flamborough, Aberfoyle came to be connected with Ebenezer, Campbellville and Moffat. In 1910, it was Aberfoyle, Ebenezer, and Corwhin. As part of the United Church of Canada, Aberfoyle was first on her own, then formed a three-point charge with Freelton and Strabane. After that Aberfoyle was on her own once more under the ministry of Mr. A. W. Bowden. 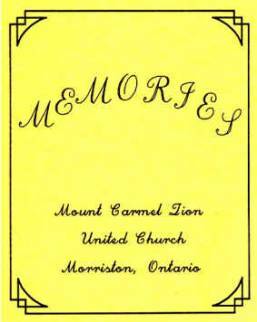 During the next years Aberfoyle and Morriston were served by student ministers until 1975 when the two churches came together to form what is now known as the Mount Carmel-Zion United Church. Over the years many ministers have served the Aberfoyle people. Many people served their Lord in the Aberfoyle church and many will carry with them memories of the Aberfoyle church and its mission of worship, praise and service of Almighty God. The history of the Morriston Church is long and varied, being first known as the Evangelical Association. Later this name was changed to The Evangelical Church and when the parent church in the United States united with the United Brethren Church, it was changed once more to The Evangelical United Brethren Church. In January 1968, the Canada Conference of this denomination joined the United Church of Canada and is now a part of that family. The work began with the early German settlers who came to this area, bringing with them their Christian traditions. At first they met in their homes with someone taking the place of the "class leader" and reading a sermon from a book. On May 13, 1840, Joseph Harlacher, a missionary who had been sent from East Pennsylvania to Waterloo area, came to visit old friends at the Nicholas Beaver home. Immediately, word was sent out to the neighbours and that night a “preaching service” was held. That was the beginning and by October of that year the first well attended meeting was held in the John Calfas home. On New Year's day 1841, the Sacrament of the Lord's Supper was observed. A series of Revival Meetings followed and we were told that 45 people were received into the fellowship of the Church of the Evangelical Association. For a number of years, services continued to be held in the homes. Finally, a log meeting-house was erected on a 1/4 acre of land on the Calfas farm. According to the 1851 census, it held 100 people. This log church was on the Brock Road (now the busy #6 highway) in the middle of the village block on the west side (where the home of Gerald Warner, Esq. now stands). It was later turned into a stable used by the hotel and has since been demolished. In 1856, a red brick church was built on its present site, made of bricks from the Morriston Brick Yards. The street leading from Brock Road to Victoria Street, where the church stands on the corner, was called Church Street. In 1880, this building was enlarged and generally improved. The first parsonage was a log and frame building erected long before 1880 and was valued at $200.00. In 1894, the present brick manse was built. Part of that first parsonage is now the vestry and minister’s office, which was renovated and refurbished in 1978. The “utility room” at the rear of the manse is also part of that old parsonage. It wasn't until 1952 that we had a basement under the church, where Sunday School classes and social gatherings could be held. Up until that time, church suppers were held either in the small vestry or in the Foresters Hall. This meant much “carrying and lugging” of dishes etc. up and down Church Street hill, the ladies claimed. Under the leadership of Rev. E. E. Dorsch, the basement project was planned and carried out with the help of many willing volunteers. The work started by burrowing under the church floor and the gigantic task of digging 26,000 cubic feet of earth and passing it out bucketful by bucketful followed. On November 16, 1952, the basement was dedicated by Bishop J. Balmer Showers and a memorial plaque unveiled in memory of John Winer, a former Sunday School superintendent and prime instigator of the project. Now the ladies can cater to their dinners from a well-stocked and convenient kitchen, church socials can be held, the young people have a place to meet and many other gatherings take place in this room. In 1911, a system of acetylene gas lighting was installed in the church. This served until the hydro came to the community in the early 1920's. However, the coal-oil lamps were always kept ready in case the gas died down, which it frequently did. The present deliers in the sanctuary are a memorial to J. Howard Winer, a lifetime worker in this congregation. Heating has also advanced over the years. The two large box stoves with their long lengths of stove pipes and those hungry wood boxes behind them are a thing of the past. Next came the oil burners, which had a habit of going out and finally a coal furnace when the basement became a reality. This, in turn, was adapted to burning oil and when it had served its time, a new oil furnace was installed in recent years. It was in 1960 that the memorial windows were installed. In 1980, the final phase of the renovations planned was completed. The vestry and church office were in use, the exterior of the church was painted and the brick work had been repaired and pointed, the building had been insulated, the sanctuary painted, carpeting laid in the aisles and chancel, new hymn books in the pews, all the result of careful planning, dedicated service and sacrificial giving on the part of the people. It was a day of great rejoicing. Morriston circuit was at one time, one of the strongest and most promising in the Conference. It took in, besides Morriston, Ancaster, Waterdown, Beverly, Hespeler, Preston and Galt, but by 1880 these other points had been absorbed in the surrounding areas. It is interesting to note, that on April 10, 1862, the 14th Annual Conference in Canada was held in Morriston. Sons from two prominent church families entered the Christian ministry, namely John C. Morlock and John W. L. Huether. The work was at first carried on in the German language and later the morning service, only, was in German. It was about 1918 that it became totally English. The Morlock family had great musical talent and the choir members of the Morriston Church were often guests in the surrounding churches. Miss Louisa Morlock was church organist for over 40 years. Christian Education was of prime importance in the early church and a Sunday School was begun almost at once. Since this was carried on in the German language, others from the village wishing to learn this language often attended the "school". Young People’s groups were organized and have been active throughout the years. Our Messengers group today is a good example of that. In 1940, the Centennial of the Morriston church was celebrated. One of the highlights of this service was the christening of the twin sons of Mr. and Mrs. David Beaver. These infants were the great-grandsons of Nicholas and Charlotte Beaver in whose home the first service was held. In 1975, the congregations of Aberfoyle United Church and Morriston United Church became one and now function under the name of Mount Carmel-Zion United Church. The Love of God is everywhere. Because I surely love it so. Who have gone to be with our Heavenly Father long ago. Going to church and Sunday School to hear the message of Grace. Telling of Jesus, love in whom we can trust. Which still linger in my heart and mind. Those lovely voices still ring in my ear. Let us all do our best from day to day. With friends and neighbours who really care. As I have been a member of a committee to prepare a history of this church, I will try to make a start toward this end. It was not to be a dull paper listing Ministers and Officers in an exact chronological way but rather an interesting look at times gone by in relationship to church life here in Morriston, Aberfoyle, and the township, and also in our relations with our neighbouring Christian worshippers. I am certainly not an authority on historical facts, but a few years ago I had immense interest and enjoyment in helping my cousin, Marjorie Clark, with her commendable work in connection with her “Our Village of Morriston”. Marjorie has given me permission to use any of the significant historical discoveries that she made while preparing for the writing and eventual publication of this interesting and revealing history. By the way, this book is available for purchase. It contains family trees, historical facts, chronology of all the churches, businesses, families, artisans and everything pertaining to the history of Morriston. It is hard bound and well worth the price asked for it because I can only conservatively estimate the cost in time and research in its preparation. For my start, I shall begin about ten years after the middle mark of the existence of this church. I was born Dec 9, 1922 and was baptized the following year by Rev. Wittich. My father, Bert was a life-long member of this church and my mother, Mina (nee Hartmier) was a member of the Evangelical church in Milverton before coming to Morriston to teach school at S. S. # 8 Puslinch (Morriston School). So it was not difficult for them to find themselves completely at home in the life of this church. As I mentioned, I was baptized by Rev. Wittich in 1923, who was succeeded the following year by Rev. Hammitt. His ministry was the first in my recollection. As we have been asked to interpret happenings and interesting incidents in connection with our ministers I will mention one that stands out. Apparently Rev. and Mrs. Hammitt received unexpected guests for supper one day. Mrs. Hammitt was deeply distressed because she was not prepared for company. However, Mom came to the rescue and traded her roast beef dinner including mashed potatoes, gravy and vegetables (for which Dad had his appetite all wetted) for a chunk of “Big Bologna”. After that incident, Dad would never eat “Big Bologna”. Mr. Hammitt was succeeded by Rev. Domm for a short period and then Rev. Zimmerman. Mr. Domm passed away shortly afterward as a result of a brain haemorrhage brought on by cranking his old 4.90 Chev. Mr. Zimmerman was a tall man with reddish gray hair and was well liked by all. Then came Mr. Grenzebach with his wife and son Carl, who grew up in Morriston. They had other older and grown-up children but Carl was the only child at home. Grenzy was a good student, but being a minister’s son he was taken advantage of. One day, he was being teased by some older boys who partially cut his hair. The local barber had to finish the job properly because everyone was afraid to let Carl go home in such a mess. Rev. Grenzebach had a 28 or 29 Model A Ford. One day he decided to teach “Mama” to drive. He showed her how to start the old Ford and how to get it moving, but he failed to show her how to stop it. They were in the yard behind the church facing the old driving shed. The end result was that “Mama” and the Reverend went in the shed door, out the other end through the wall and into the garden next door. Mr. Grenzebach left Morriston to minister at Roseville, Ont., and finally retired in Elmira. Carl married, but at my last contact with his wife, Carl had suffered a stroke and was confined to hospital. Rev. E. H. Bean came next. I was about 14 at the time and he was still here at the time of my enlistment in 1942. He had 3 children that I remember, all grown-up. Kathryn was a High School teacher in Thorold, Emerson was a Customs Officer in Windsor and the other brother was a professor at Ann Arbour (Michigan) College. I was starting to play around with cars and motorcycles at that time and we had many “road tests” together. Rev. Neill came to us after his (semi) retirement from Aberfoyle and Freelton United Churches. This was during war time and his family made many friends in the community. His 2 daughters both married McKee Brothers, famous in the manufacture of farm equipment. His son, Leigh was a grocery store owner in Port Robinson. After World War II, Rev. Siebert came to us as minister after his chaplaincy in the Canadian army. Two of his attributes were growing gladioli and directing amateur drama. He directed a play, which anyone who saw it will never forget, “Aunt Susie Shoots the Works”. We played in every rural community in this area. His dedication to “Glads” won him the position of President of the Ontario Horticultural Society. He died a couple of years ago and Bea and I had the privilege of helping to plant a tree in his memory at the Arboretum of the University of Guelph, under the direction of the Horticultural Society. He also introduced to our church the young peoples group known as Christian Endeavour and that experience has left a lasting effect on many of us who were young in those years. Mr. Bender, with his second wife “Honey”, came after that. He was a short, pleasant man. He used to visit my father on the front verandah. Dad used to say, “Well if he can’t make it home on foot, I can always roll him home”. One Sunday at communion, which he was serving personally in the pews, he went through the usual liturgy --- and to save you from your sins --- and then in a low voice so that the people on the opposite side of the church would not think they were left out he said, “I’m coming around to the other side”. Incidentally, I was on the other side. Emerson Dorsch came to us as a student minister. I had not known him previously but I knew his brother Carl very well as he had worked for our cousin near New Hamburg, which was his and Emerson’s birthplace. I had the unhappy task of going down to Harvey Laking’s home, where he was on a pastoral visit one day, to break the sad news that Carl had just been killed in a farm tractor accident. Emerson helped Bea and I to renovate the old implement shop across from Westlake’s into an apartment prior to our marriage in 1949. When the idea of building or perhaps more correctly excavating a basement under our church was instigated by Mr. John Winer, accompanied by a substantial financial donation, Emerson became our chief building superintendent. His zeal, know how, strength and ability to get along with people was the most important factors in bringing this project to completion. Mr. Dorsch passed away in recent time, a victim to cancer. About this time, Rev. W. E. Beese retired from Market Street Church in Hamilton and came to retire with his son Carl and daughter-in-law Marg. We were married by Rev. Beese assisted by Rev. Dorsch. Rev. Beese conducted a very deep and informative Bible Study in conjunction with our Young People's group and Christian Endeavour Society in this period. Mr. Reibling came to be our minister. He was a tall man and very sincere and sedate. Norman had a 1936 Dodge. It had 90 thousand plus on the speedometer and he was looking toward the 100,000, at which time he would trade it. The body was in good shape except that the original rich gray had so oxidized that it was like chalk. When the motor failed we were given the job of repairing it, a quite extensive repair job. Even though we used fender protectors and used every precaution, the rich gray came back to life on the fenders and Mr. Reibling insisted that we were negligent and made us polish the rest of the car. After considerable study, including classes at the E.U.B. Seminary at Napierville Illinois, John Huether was placed in Morriston as our minister. Out of modesty and respect to our relationship as first cousins, I will content myself and you by saying that he ministered well to this church. However, there is one incident that stands out. After one sermon when John preached, among other things, about the controversial faith healings of Oral Roberts, when we called on Dad, as was our custom each Sunday after the service, Dad remarked, “John was pretty hard on poor old “Orlie” this morning”. I agreed but I also had to agree with John in his comments. On May 31st, 1990, I had a pleasant visit from the former Margaret Tuttle, daughter of Rev. Nash. Margaret was christened here by her father during his ministry in 1919. She remembered the Hinglemans, the Finkbeiners, and the Huethers. Later, Rev. Nash moved to the States to further his studies with the Evangelical church in Minnesota. He later returned to Kitchener. Rev. Wm. Durst (1959 - 1965) came here from Port Elgin. He was a fine minister. He must have served in the Renfrew area at one time because that was Mrs. Durst's home county. My friend, Peter McLean, used to recall how well she could dress and roast a portion of venison. Mr. Durst did not like to navigate the one way streets of Hamilton so whenever he made visitations to the hospital in that area I was his driver. He was a very unassuming person, but when it came time for prayer in the hospital he called the entire ward to order and respect, and delivered his prayer to everyone present regardless of their race, colour or creed. Unfortunately, he died while living in the manse. He is interred in Crown cemetery. We are looking forward to his family visiting on our anniversary, Bert of Fonthill and Ruth of Chatham. Mrs. Durst is now a resident of Albright Manor. Rev. Peter Tucker (1965 - 1967) and his wife, Nancy were from Wales. They made many friends in Morriston. He was a student and stayed in Toronto and came home weekends. He graduated and was ordained while here. After ordination, they left for the Mission field in Zambia, Africa. Poor health forced them to return after one year. After convalescence, he took up the ministry again in Rockwood and later Dundas. In 1975, he returned to Wales and in 1989 returned to Canada and is now serving the church in Belgrave. Rev. Wm. Boyd (1967 - 1971) came to minister here with his bride Margaret. Heather was born while they were in Morriston. He also attended seminary while serving and was ordained. During his ministry, the Aberfoyle and Morriston Social Club was formed. Bill was from Orillia and Margaret from Waterloo, so that their relatives were frequent visitors at Sunday morning services. When Bill was ordained he moved to Carrot River, Sask.. He has recently returned to Parry Sound, Ontario. Rev. Eric Warren served here for an interim period in 1971. I don't remember much about his ministry but he was a great visitor and in the short period he was here, he visited all members of the congregation. Any work projects during his term, he and his wife were in the midst of what went on, such as church housecleaning. While here, they made many lasting friendships with many members of the congregation. Rev. Ian Shapter (1972 - 1974) was not ordained when he first arrived, but graduated and was ordained during his stay. Our family liked him. We called him back to assist in the marriage of two of our children. He and his wife and two children moved to Drayton where their daughter of 13 died of an asthma attack. After a few years, he left the ministry but I am certain not the faith. Olga McKellar (1974 - 1980) came to us as our first full time lady minister. She was a lay supply, with a profound theological knowledge. One Sunday morning in her sermon she denounced those people who told “borderline” jokes. After church I said to Olga, “I think you were directing that discourse toward me”. Her answer: “If the shoe fits, put it on”. I also remember her husband Peter and their children, Neil and Shelly. Peter served communion here on many occasions and presided at meetings. It was during Olga’s ministry that Mt. Carmel United Church, Aberfoyle and Zion United Church, Morriston amalgamated to form Mt. Carmel Zion United Church. Also during her time here, the vestry was renovated and the attic converted to a church office. Rev. Jessie Jensen (1980 - 1983) was a student when she came to Morriston, but was ordained while serving here. While Jessie was here her family was growing up and they regularly attended services. Her husband, Ed used to sit in the pew ahead of us and he and I developed a wonderful Christian relationship and would discuss our work day activities. During her tenure, the land to enlarge the parking lot was acquired from the Stewart farm. Also a dusk to dawn light was put in the parking lot and fans installed in the church. Jessie was a very caring and compassionate minister and was always there for us. She left after three and one-half years of ministry for the neighbouring parish in Freelton and Strabane. Dale Massender (1983 - 1985) and his wife Diane lived in Kitchener. Diane worked there while Dale continued his studies in Toronto and subsequently was ordained. They were a musical couple and added greatly to our choir. After ordination he made good his promise to return to Newfoundland to serve the church where he had been a student minister. Rev. George Addison (1985 - 1988) was not long in the ministry when he came to Morriston. He was an enthusiastic and out reaching minister. His wife, Kathleen, attended the Centre for Christian Studies in Toronto, and graduated as a Diaconal minister. Their children were Mark, Peter, and Lincoln. Rev. Addison had extra ministerial projects such as ministering and counselling at the Guelph Correctional Centre. He also conducted early morning Sunday services at Mini Lakes Park in the summer. He attended local council meeting and reported to the local paper. He was active with the children’s ball teams. The Addisons left to work as a ministerial team to revitalize a downtown Hamilton church. Rev. John Langton (1988 - present) came to Morriston with his wife, Laurie and children, Shelly, Jennie and J.T. from Stoufville. Rev. Langton is here with us now and I know that the welcome extended to him is the same as that extended to the ministers by the early members 150 years ago of these two Community Churches. My earliest recollection of the Sunday School was when I was in Miss Louisa Morlock’s class. She had been teaching the kindergarten class for quite sometime, which was probably around 1925 or 1926 and she continued to do so almost until her passing. Grandfather (John) Huether was superintendent at the time and he held that position until his death in 1936. We had an opening period, a study or lesson period and a dismissal. Grandfather had a “standard” prayer which he offered every Sunday. When we were young, we did not fully appreciate it, but as we grew older and even long after his death we realized what a wonderful prayer it really was. It contained such scripture gems as: “Trust in the Lord with all your heart and lean not upon thine own understanding”, “A well of water springing forth from thy soul”, “In all thy ways acknowledge Him and he shall guide and direct thy path”, “Renoun to the honour and glory of the Holy Name”. If you happen to peruse a copy of the “New Canadian Hymnal”, which is now quite old, you will see the hymns we used to sing in Sunday School accompanied by the organ music of Louisa Morlock and led by such singers as Minnie Durnin, Minnie Greger, Simon Morlock, John Fahrner and many others. A complete list of officers is contained in Marjorie Clark’s book. John Winer succeeded Mr. Huether as superintendent until 1950 when he passed away and his leadership was passed on to Edgar Boucher who had been his assistant. When Mr. Boucher became ill I took over his duties and he remained on as my advisor in the capacity of Honorary Supt. I cannot overlook the contributions to the Sunday School in those days by the faithful of those days, the Winers, Morlocks, Huethers, Bouchers, Fahrners, Martha Debo, the Wyse family, Suttons, and Marg Hingleman, as she was then known, to mention only a few. In later years, I was in charge of the Adult Bible Study Class. My chief advisors and assistants were Simon Morlock and Andrew Ord, but our study group was of such a nature that without exception every member was encouraged to participate. One of the topics which frequently come up was this: Why do good people have to suffer? We never did come to a solid or definite conclusion, but the unwritten motto of the class was “Share ye one another’s burdens”, which was truly acted out by the members. At Christmas time in one of the last years that I was teacher, I decided to get a token of some kind for each member of the class. I went to the Bible Book Store where I usually bought teaching materials and asked “Jean” the clerk, whom many of you know, for a suggestion. She said “Mr. Huether, what is the average age of your children?” I'll never forget the expression on her face when I truthfully replied “Oh, about 80”. On another occasion when Bea and I paid a visit to the nursing home, I was explaining proudly to the other residents, that these ladies - there were either 3 or 4 at the time - had all been in my Sunday School Class, when one of them piped up and said "and that's why we're all so bad!" Before recent times, the Sunday School was a separate unit in the life of the church. Although subject to the rules, guidance and disciplines of the quarterly board, this important part of the church activities was left up to elected officers of the Sunday School. In addition to the well-organized class activities during the Sunday School period, there was a Home Department and Cradle Roll. Each department had elected officers in charge. The Cradle Roll Superintendent recognized each child born in the community of parents who had even the remotest connection with the church. She would follow through this interest with visits and little gifts, until the child was enrolled in Sunday School. The Home Department Superintendent provided visits and Bible study literature similar to Adult Bible Class, to those unable to attend due to health or business reasons. Audrey Mast was elected Sunday School Superintendent in 1980 when Wm. Huether stepped down. She was well qualified for this position as she had been a teacher for quite a number of years and a regular attendant at church. During the following years we observed the annual Sunrise Services, Sunday School or Congregational picnics and Christmas Concerts. At the same time, Audrey was leader of a children’s group. Some of the leaders who assisted were Sandra Stewart, Ginny and Audrey Davis, Cheryl McLean, Lisa Laking, Jerry Dyment and Jean Corlett. This group worked closely with the Sunday School. There were about 30 regular attendants. While Audrey was teacher and superintendent, she was living in Aberfoyle, as she still does, and when she came to Sunday School, she always had her car or van full of children from Aberfoyle. She was succeeded by Cheryl McLean, the present superintendent, in 1984. I am not certain at what point in the history of our church Young Peoples was initiated. However, I am in possession of several copies of a yearly calendar issued for one of the years that Rev. Sauer was minister here. He served during the years 1895 to 1898. From the calendar, I am assured that they were well organized at this time. The names of the officers are all listed, as are those of the various group leaders. The events and meetings were planned and listed for the entire year as were the topics to be discussed at each meeting. This format had changed very little by the time I became involved with Young Peoples. We had to be a certain age before we were allowed to join. The group involved not only “young” people from this church, but also adults and young people from this church and from any other church in the community and others who were not connected with any church. As I have mentioned, we were divided into different groups. Each group was in the charge of a Group Leader and a partner or assistant and the meetings and social events were all planned well in advance by the Conveners. The meetings were always attended by the pastor or some other responsible Christian who guided the meetings and sometimes commented on the essays that had been presented. Some of the most memorable events were the skating parties, sleigh rides, toboggan rides and crokinole socials. These were usually followed by a pork and bean feed and delicious coffee which was brewed in a copper boiler atop the old box stove in the vestry. It was always an excellent opportunity for the people of the community, especially the teenage boys and their opposites to get together in Christian fellowship. After World War II, the format of the meetings was somewhat changed as we became involved with the Christian Endeavour Movement under the direction of Rev. J. Wes Siebert. 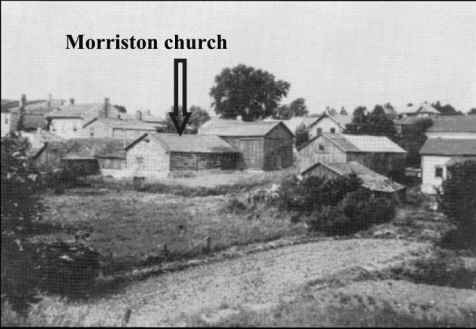 Our Morriston Church was quite prominent among Christian Endeavours as quite a few of our members were on the Hamilton Area Executive and some were on committees at the Provincial and Canadian levels. One of our associates who visited Morriston quite frequently was Mary Campbell of Hamilton who was a member of the International (or World) executive. Many of us attended yearly retreats at Geneva Park on Lake Couchiching. One year our main instructor was our own Bishop Raymond Veh, head of the Evangelical United Brethren Church of America. When Bea and I were married in 1949, (we both had become members), the group presented us with a beautiful Bible, and we were deeply appreciative when they presented us with a second Bible when they learned that we had lost the first one in a fire. As members the great family of Christian Endeavourers, we made some lasting friends in the different areas (Toronto, Hamilton, Niagara, Rodney, Sarnia and Kitchener). Business pressures and the arrival of our children in rapid succession prevented us from regular attendance in the fifties. We had a lively Young Peoples at that time. All the Young Peoples groups in the Hamilton Conference at that time interacted in many ways. Ball games in the summer were a big thing. When it was our turn to host, we had to go to Eden Mills, that being the nearest ball field with lights. Trips to Hamilton to play volleyball in a church gym was something new for us - we were scared. Ball games in Hagersville, Cayuga and Selkirk took us to lands quite unknown to us at that time. After a ball game one night we all decided to go to Niagara Falls to see the lights and then they weren't on. Jeannie kept saying, “My parents will be wondering where I am.” Alma Laking, Brock Laking, Don Stewart, Gary Tatum and others always had a car available to travel. Ruth Durst and Jeannie Penrice remember being delegates to a Young Peoples weekend in New Hamburg. They were billeted at the undertakers. There was little sleep for them the first night, but after being shown around the next day, they enjoyed seeing all the facilities. Christmas concert on Christmas Eve was always a highlight. It always opened with some little person reciting “Welcome Welcome”. Marg Patterson’s class, which was all the Young Peoples, always concluded the concert with a Nativity Play. My, we had fun preparing for it! Winnie Pylack sang “Silent Night”, while Gary Tatum held the music behind a newspaper. Jeannie Penrice was the angel when she said “Hail, Behold I have good tidings.” David Pylack added in background snow, rain and sleet. What fun we had! Martha Debo and Marg Patterson always helped with our Sunday night meetings, which were always well attended. Our meetings included worship and a program, after a Bible relay, conducted by Mrs. Durst. We sure learned a lot about our Bibles and who to choose first for our team. Sunrise service and breakfast on Easter Sunday were looked forward to. There was a meaningful service in which we all took part. Marg Beese (Patterson) and Bert Durst had a hand in this. Marilyn Moore and Ruth Durst took charge of the music. Dave Williams and helpers boiled the eggs. We tried to have toast, but we blew so many fuses that we had to settle for hot cross buns warmed on the furnace pipes. One year we ran out of eggs so Winnie and Jeannie went to Bob Penrice’s for more eggs. Easter came early that year so there was still ice around. When they arrived at the church in their high heels they slipped and away went the eggs and all. Some people were short on eggs that year. Once a month we held a Sunday Evening Church Service. The collection from these services along with money raised at a car wash was used to buy the “Red E.U.B. hymnals” that are still in the pews today and used on special occasions. In the winter there was at least one tobogganing party back on Currie’s hill. Eileen and Roger Williams, David and Isabelle Thomson and Rose Patterson were always involved in all activities. When it turned real cold there was a skating party on the pond. The boys would build a fire and put down car seats to sit on while we put on our skates. Back to Christmas time - we would go out carolling through the village and then walk back to Mr. and Mrs. Bill’s. They would have a fire in the fireplace, hot chocolate and cookies ready with the dog curled up by the fire. We would all sing and sing, then we would walk home. It is now the site of the nursing home. At the end of the season we would have a banquet, catered by the ladies of the church. As we look back on these memories, we realize what a valuable lesson we learned and what good times we had. Some time in the late part of the fifties, the adult men of the congregation formed a men’s choir. They were good. We younger fellows got a real kick out of these “over the hill Billies”, not because of their singing, but because of the comments and exchanges made at the practices. Some of the members, if I'm not mistaken were - Jim Bill and Bert Huether, Simon Morlock, and George Chalmers. I understand there was a men’s choir in the 1930’s. Some of the members were Bill Rymarzik, Simon Morlock, and Ethelbert Morlock. I guess it was about 1965 when we started the junior choir in the Morriston church. After many years of faithful service, Mrs. Blanch Chalmers decided it was time to retire from organ duty. The choir at that time consisted of a few adults and had dwindled down to perhaps three or four members. From assistant pianist, I graduated into the full time service of choir leader and pianist with the capable assistance of Marilyn Moore. We invited girls from the age of 10 to come to the church for Thursday night choir practice and at times we had up to 15 young ladies. Rather than the traditional heavy anthems that we had been used to we asked permission to use a lighter type of anthem that was much easier for the girls to learn and enjoy. We enjoyed many a laugh on practice night and of course had our good and bad Sunday services. Christmas time was the most enjoyable time of the year and we always went carol singing in the village with hot chocolate served at the church afterwards. We were invited to several other churches to take part in special nights and once a year we put on a choir night and invited the Lowville United choir to come and join us in song. This special night was our means of raising funds to buy our music. We were very proud of our girls and were very lucky to have so many young ladies to share in our worship service. It was an honour to be with these girls for the fifteen years that I was their choir leader and over this period of time to be asked to play for many of their weddings. It is very difficult to write about the early history of the Ladies Aid as there are no records available before 1912. However, it is an accepted fact that there was a women’s organization before 1900. One wonders who might have belonged to that first group of women, interested in helping the church. Maybe ... Mrs. Elfner, Mrs. Geo. Finkbeiner, Mrs. Bernard Brown, Mrs. Gayer, Mrs. Fahrner, Mrs. J. Frey, Mrs. Peter Beaver, Mrs. Tom Morris. Certainly by 1900, familiar names such as Mrs. Jacob Fritz, Mrs. Wm. Winer, Mrs. Fred Schultz, Mrs. J. Fahrner, Mrs. Wm. Mast, Mrs. Lou McLean would be added to the list. In the minutes of the Annual Business Meeting of the church in 1901, there is a statement that the Ladies Aid promised $10.00 to meet the note against the parsonage. The minister at that time was Rev. Krup. While Rev. W.E. Beese was pastor here, between 1904-1908, the group was re-organized and a constitution drawn up. We have a treasurer's report from 1912, and from 1924 there are complete minutes of the meetings. The first known President of the Ladies Aid was Mrs. Krup, and since that time the following women have served in that capacity: Mrs. J. Frey, Mrs. J. Fahrner, Mrs. J.C. Morlock, Mrs. S. M. Hauch, Mrs. J. Hammett, Mrs. J. Ames, Mrs. J. Hingleman, Mrs. J. Grenzebach, Mrs. E. Boucher, Mrs. R. Penrice and our present leader Mrs. Marguerite Thomson. -The Ladies Aid proposed to look after the remuneration of the church organist for 1907. -The Ladies Aid also gave a favourable report as to what they had done. -A vote of thanks be tendered the Ladies Aid for their help during the year. Mrs. Eli Winer read the Ladies Aid report. - There is a special record of $85.00 given, and a hearty vote of thanks was moved for their great aid. - The Ladies Aid is alive and active. This is the first time a report was given in detail: Cash on hand, $16.43. Bank balance $118.87. They didn't do badly, did they? - The Ladies Aid is requested to prepare a banquet for the next Annual Church Meeting for the purpose of getting more out to the meeting! - Moved by Mrs. Kistenmacher that the Ladies Aid pay the deficit of the Missionary Fund. Motion seconded by Mrs. Fred Schultz. There is also mention made of an acknowledgement from Miss Vera Schweitzer, missionary in China, of $5.00 sent to her. Miss Schweitzer is now Mrs. E. Dahms, the president of the Canada Branch of the Women's Society of World Service. So we see the church in those early days was helped by the ladies. One of them has said that they gave many a $100.00 to help balance the budget before Conference. What else did they do? According to the minutes and reports they have always helped with the up-keep of the parsonage and with the general church fund. These items are mentioned: lumber for tables, $17.18; material for railing and curtains; in 1925 they gave $75.00 toward installation of electric lights; repairs to vestry; fire fund at Haileybury $10.00; Sick Children's Hospital $10.00; cups and saucers -- oodles of them! -- choir books; blinds; repairs to stoves; coal oil; repairs to church (frequently); flowers ... in fact they paid for everything from needles to electric lights. There is one item that is intriguing; Mrs. L. McLean $2.00 for ice cream, but there is no mention of who ate it. And another interesting bit, “treat for working women, 25 cents”. “Where did they get this money?”, you ask. At first the fees were only 5 cents a month… do you remember the copper bags? made by the society and sold, also quilting was done on order. That was the main source of revenue. One member recalls that when children came home from school and asked, “Where's Mom?” the answer invariably was, “At the church quilting”. One is astonished at the special projects and the money made at them. In 1922 alone, Garden Party $373.62; Proceeds of Tea Meeting, $93.98; Box Social, $112.15. All this in one year! There are such items as: sales of cakes and pies, $15.13; concert, $40.55; apron social, $44.05; Paisley Memorial Talent Play, “The Old Fashioned Mother”, $22.26; bazaar, $107.40 and Mary Durnin 1 cent. Maybe we of the Ladies Aid today might be inspired by reading the past records. Today the Ladies Aid still does some quilting, caters to weddings and has suppers, using the money to help both church and parsonage, as well as contributing to the Missionary effort. But after all, much as we like to help with our money, what we get out of it spiritually is more important. Today, we feel that our programs are very much worthwhile. May we never forget to tell Him who would walk with all in the cool of the night, and in the burning daylight hours -- giving rest to souls and growth to those who are stewards of His Grace. The earliest records of the Ladies Aid in the Zion Evangelical Church in Morriston was 1912, but its an accepted fact that it goes back before 1900. The minutes of the annual church meeting of 1901 show that the Ladies Aid promised to pay $10.00 to meet the note against the parsonage. The minutes of the annual meetings in the following years record: “The Ladies Aid is alive and active”. Records show that the Ladies Aid always helped with the upkeep of the church and parsonages and the needs of others. In 1923, the Ladies paid the deficiency in the missionary fund and sent $5.00 to a missionary in China. It would cost us almost $5.00 today just to get the money to China. In 1925, $10.00 was sent to the Fire Fund in Haileybury and $10.00 to the Sick Children’s Hospital. Between 1904 and 1908, when Rev. Beese was the minister, a constitution for the Ladies Aid was drawn up. When a lady wished to join, her name had to be proposed and she was voted in. The constitution was read to her and the welcome song sung: “There's a welcome here, there’s a welcome here, there's a Christian welcome here”. In 1949 or 50 or thereabout, it was decided that a basement should be put under the sanctuary. At that time our mission became very much home. One lady needing a new winter coat said: “I can wait” and the money went into the basement fund. Dedication came --- a glorious fall day. Bishop Meuller came and ever so many ministers. One, I remember, came without shaving and he came into the kitchen, where we were making scalloped potatoes, and shaved ---- no bathroom in those days. We served dinner to one and all. The afternoon was spent in meetings and visiting. After people returned from their chores --- a light supper was served and then an evening service. We were all so tired that night. It was Sunday and we’d all worn our best, including high heels. I’m still reminded that at the end of the day I said: “If I ever wear high heels to a do like this, just shoot me”. The next day was very stormy and we all remembered the words of Mrs. Hingleman, a dear old lady, who said: “Don’t worry about the weather when you are planning for the Ladies Aid, The Lord will provide”. He did, and still does. In 1953, our Evangelical church united with the United Brethren Church and became known as the Evangelical United Brethren Church. Our ladies group became the Women's Society of World Service (W.S.W.S.) ---- W for worship, S for study, W for work and S for service. With this event, our horizons broadened. We had Study Books provided for us to study and learn of our mission projects. In 1967, our church was to undergo yet another change when we united with the United Church of Canada. Thus our ladies group became - The United Church Women (U.C.W.). I think we were slow learners, for it took us a while to adopt to a new format ---- to do what we had being doing so many years. Money was always needed to carry out our “Good Works”. In the earlier days, the big money raiser was quilting. The records also show that they held Garden Parties, box socials and concerts. Later, an annual fall supper was held upstairs in the Foresters Hall. For those new to the community, the hall stood at the foot of Church street, where the park is. The menu was scalloped potatoes and ham. I remember one year we ran out of ham. There was a butcher shop in the village then (where the Kitchens now live). The only cold meat he had in the store was bologna ---- so that's what we served. There were 39 steps up to that hall and everything had to be carried up including the water. The dirty dishwater went out the window. The ladies served Bill and Bea Huether's wedding supper in that same hall. I don’t think we served bologna. Another event that was a lot of work and good fellowship was the annual church cleaning. Wood stoves had to be cleaned and blackened, wood floors scrubbed and lights cleaned. We were all tired and dirty when we finished. I remember one farm wife saying: “I need something at the store, but I’m so dirty, but I guess they have seen me clean”. Our Christmas meeting was always a highlight. The program was often conducted by the younger women, who portrayed the Christmas story in a very meaningful way. The room was always very festive. The ladies wore their best. Ladies from the community were invited as well as the ladies from the neighbouring churches. Party refreshments were served. In 1982, as a group, we felt we were so burdened with reports, etc. that we were losing our sense of purpose, and so we decided to disband. The Aberfoyle and Morriston Friendship Club, (affectionately known as the A & M Club) was formed in the late 1960’s for the express purpose of maintaining ties between neighbours. Although originally formed by long-time residents who had “grown up” together, the club was by no means exclusive; in fact it served almost as a welcome committee to newcomers to the area. Variety was the order of the day, the responsibility of hosting the monthly “keep-in-touch” get togethers was delegated in turn to each member. The host of the month enjoyed carte blanche, and all the help needed to present the club with the entertainment of his choice. This resulted in a monthly surprise for the members that ranged from a house party at the home of the host - to - trips - to conducted tours of unusual places. Some of the fond memories include corn roasts featuring contests ranging from pie-eating to nail-driving; ... a trip to a Jewish Temple complete with a guided tour through the Hebrew faith by a Rabbi; .. such cultural events as Shakespeare at Stratford; ... and on one occasion, musicians were imported and a square-dance team taught the A & M’ers how to do-se-do! Some of the major events saw neighbouring church groups as guests of the A & M Club. Hallowe’en brought out some really weird characters, then there was a “Show-and-Tell” night with demonstrations and descriptions by members working in unusual occupations. The success of the club was due to its unpretentious structure. There was no president, no committees and very few voted, although I seem to recall a secretary. The club was just a group of friends determined to keep in touch as the area began to feel the effects of the restless urban sprawl. We, (Bev and June McQuain and family) moved to Morriston from “Hogtown”. In Toronto, one can be a stranger to his long­time next door neighbour, so it was almost “culture shock” when we were invited by our neighbours to an A & M meeting. We responded cautiously, but from our first meeting on, we knew that we were truly a part of our adopted village. The people who welcomed us were: Bob and Bernice Penrice, Emily and George Bishop, Jack and Ruth Bishop, Emily Pylack, Howard and Eleanor Winer, Rev. Bill and Margie Boyd, Jean and Rod Corlett, Marg. Beese (Patterson), Andrew and Mary Ord, Bill and Bea Huether, Audrey and George Sutton, Carman and Anne Johnston, Grace and Jack Tulley, Wilma and Tom Maltby, Elsie Boucher, Harold and Maree Moore. After our arrival, three new couples joined: Larry and Bonnie Siminato, Fred and Idella Clarke, and Jim and Dale Measures. An example of the fun is perhaps pictured through this poem prepared for a Christmas Party, and recently found in the annals of the club. For an A & M party on Saturday night. And now they await for the knock on the door. The Boyds were co-hosting (he's seven-foot-five). You seldom catch preachers that big alive. For the monthly inspection of Rod's bushy beard. Measure-for Measure, (That's Jim and his wife). Right in this school-house, in '50 A.D.
Will Howard and Eleanor join in our game? Are they Winer by nature, or merely by name. It’s Andrew and Mary, who’s last name is Ord. To play safe, for them “Bill and Bea”, We’ll announce. We've invited four Bishops to keep events couth. There’s Emily, George and Jack and there’s Ruth. And the Suttons (that's Audrey and George) make it four. Will come to our party, I’m sure, if they can. Robert and Bernice will take center stage. That's Grace, Jack and Wilma and Tom ‘spectively. You girls watch your husbands, or she'll take one home! So if I’ve missed your name, just give me the word. It was July 1970, when Rev. Boyd was asked to give a Bible Study to the U.C.W. (United Church Women), during his student days in Morriston. Elsie Boucher, Margie Boyd and Bernice Penrice were appointed “To do something about it.” Thus, Good Neighbours was born. That very week, all seniors were invited for a meeting. There was a good turn out. As people, we served tea and oatmeal cookies. We reasoned that people “talk better” when they are eating. The following lines describe how our twice monthly meetings went from September till May or June. While Bernice talks a lot. How are all your neighbours? So that’s what The Good Neighbours is all about. During the season, we tried to take a bus trip. Some places we visited were Niagara Falls, Black Creek Pioneer Village, Big Creek Boat Farm, 30,000 Island Boat Cruise, Story Book Garden in London, the Flower Show at the O’Keefe Centre in Toronto, Ice Carnival in Kitchener, Christmas Lights at Simcoe, Belgian Nursey in mid winter, and a fall tour to see the coloured leaves. After a couple of years, it was suggested we have A New Year’s Eve Party. After due consideration, it was decided to have our New Years Eve party the first Friday in January. Marg made paper snow flakes, Bob, Russell and others blew up balloons and Elma made hats. Friday, my how we worked, making the basement very festive - and hung the mistletoe. Before we left, the clocks were put on two hours. Norma Smith and Mabel Irving were invited to join us to provide music for dancing. Everyone arrived early, dressed in their party best and the fun began. We sang, we danced, we told jokes, drank punch, played party games. Before we knew it, the clocks said 12 o’clock. The girls played Auld Lang Syne - we all sang. The balloons came down, the noise makers came out and streamers were every where. Everyone wished everyone else a Happy New Year, underneath the mistletoe. Then we had a buffet supper. Thus, the years passed. As we became more senior, it was decided to have our dinner catered by the Morriston Women’s Institute, at 5:30, to start our party. One by one, our members passed away or moved into apartments in Guelph. They were very faithful at coming back, but time takes its toll. We closed about 1982. We were left with friendships and many memories. A number of ladies met in the Morriston Evangelical United Brethren Church in August of 1949 to talk about organizing a Canadian Girls in Training group. An invitation meeting was held on Sept. 6, 1949. The name Gunleigh was chosen for the group. (This word appears over the fireplace in Dundurn Castle in Hamilton, Ontario. It is the Gaelic wording on the McNab family crest and means “Fear Not”.) The leaders were Mrs. J. Bishop, Mrs. C. W. Beese, Mrs. T. G. M. Bryan, and Mrs. E. Gray. There were 21 members the first year. The first meetings were held in the old Morriston Hall, later in Morriston Evangelical United Brethen Church and finally in Duff’s Church. Other leaders from our church were Mrs. J. Kitchen, Mrs. R. Penrice, Mrs. Robt. McKay, Mrs. O. Tatum, Mrs. Wm. Boyd, and Miss Rose Williams. The first treasurer’s book cost 25 cents, the first secretary book was 40 cents, the first study book 75 cents and the leaders book was $ 1.00. The girls donated money to W. S. W. S. Morriston, Morriston and Aberfoyle Mission Band, also a picture to Duff’s Sunday School. The girls visited shut-ins, collected for the Canadian Bible Society, sang Christmas carols through the village and at the Morriston Nursing Home. On Feb. 6 1960, the girls met in the E.U.B. church basement to make new skirts for the C.G.I.T. uniforms. Oct. 1960, they planted bulbs at both churches. Feb. 1961, had a work bee to clean the E.U.B. church vestry. The girls conducted Vesper Services at Christmas and attended rallies. An important part of the C. G. I. T. program was worship, Bible and mission study. Crafts were also important since many articles were sold at the C.G.I.T. bazaar. The group disbanded in 1981, and as one of the first leaders, I had the joy of seeing one of the first members taking an active part in Presbyterial U.C.W. along with being busy in her own church. C. G. I. T. gave the girls a solid grounding in Christian living and helped them to live up to their purpose “to church health, seek truth, know God, serve others and thus with His help become the girls God would have us be”. During the ministry of Rev. J. H. Grenzebach at Morriston, his wife organized a Sunday School Class. She was the teacher and some of the members were Myrtle Winer (Carroll), Mary Durnin (Tatum), Jean Martin (Hall), Isabelle Boucher (Mills), Gwelda Sutton (Poque), Carl Grenzebach, George Kitchen and Bill Beaver. They had some interesting activities and visits to functions in other churches, one being a “Tent” meeting in Milverton and another meeting in St. Jacobs as well as having a fine Christian learning experience. The class was named “pals” and below is a copy of the class pin each member wore. The Brownie Group was called the first Morriston Brownie Pack, enrolled May 1950 under the leadership of Brown Owl Dorothy Huether, Tawny Owl Pearl Huether and Packy Laura Quail, at the Bert Huether family home. A year later, in 1951, commissioner Mrs. F. W. Dixon presented the group with a toad stool. For 1952, Mrs. Marguerite Thomson succeeded Pearl Huether as Tawny Owl. In 1953, a presentation of an aluminium tray was made to the leader who was by this time a bride-elect (Mrs. Wm. Morgan to be). A ceremony in honour of the passing of King George VI took place about this time. During the Brownies term in Morriston, the mothers used to make iced cookies at St. Valentine’s Day and St. Patrick’s Day for the girls to sell around the village to raise money for badges and pins. These badges and pins were to recognize credits that the children had achieved. This allowed them to fly-up to their next level, but only on the recommendation of their mothers, who monitored their duties and conduct for such things as taking care of their pet or learning to sew on a button. After the dissolution of the Morriston Group, the Brownies was re-organized in Aberfoyle under the leadership of Mrs. Cliff Gordon. In the late 1920’s and the 1930’s, Prayer Meetings were held in the vestry of the church. There’s no doubt they were held long before that, but that is my earliest recollection. They were usually held on Wednesday evening at 8 P.M.. The devout and faithful of the church were always there. I remember too little of these worship sessions. I do recall that after proper introduction of prayer concerns, everyone knelt on their knees and with genuine sincerity supplicated aid from God to alleviate the various distresses. I remember accompanying my mother on a very few occasions. Wednesday afternoons were “off”, a break for the merchants of the period, but Wednesday evening was something the adult Christians of Morriston Church looked forward to, in anticipation of a blessing. Rev. E. H. Bean and Rev. Sauer were both ministers at Morriston. After the war, in the late forties, Morriston church was host to the Ministerial Association of the Evangelical Church. I don’t remember much about this event, but there was one thing that I can recall: Rev. Caughell, who was minister in Renfrew county and who later served this congregation was in attendance. He was driving a 1939 Dodge or Plymouth Coupe with disc wheels and 21 inch tires. He told us young fellows who were looking it over that the special tires gave the car more clearance underneath and also provided better penetration of the snow banks in that area. It was the only car I have ever seen like it. The first recollections of church activities start with catechism class on Saturday morning in the vestry and Sunday School on Sunday mornings at 10 a.m. Miss Louisa Morlock was the beginners’ teacher, reading stories to the class and each child had to say a little Bible verse each Sunday. Of course, each one was given a little pamphlet with a picture on the front and a bible story on the inside. Then came graduation to the auditorium Sunday School. Mrs. Ames was the teacher there. Then on to the next class with Mrs. Mina Huether in charge. In this class we had to participate, reading part of the lesson and since Mrs. Huether was a teacher you were asked to answer questions on the lesson. She was a great organizer. We chose the name of Ever Onward Class and we would assemble at each member’s home once a month for a social evening to play games or crokinole. The next move was on to the teenage class with Mr. John Winer as teacher. After Mr. Winer was not able to teach, we were moved to the Bible class with Mr. Simon Morlock in charge. Other early recollections were Mr. John Huether as Sunday School superintendent, then Mr. Edgar Boucher and Mr. Wm. J. L. Huether as assistant. Another part of early church life was the Young Peoples group known as the Evangelical Youth Fellowship (E.Y.F.). This group encompassed everyone from early teens to senior adults. Everyone seemed to participate and enjoy themselves. It had a very formal structure - President, Vice President, Secretary, Treasurer and four groups. Each group was responsible for a meeting once every four weeks in their turn. The guidelines for the topics each week were taken from the Builders, a weekly youth publication at that time. The Youth Fellowship took evening church service at the close of Youth week in February and also the devotional part of the Easter Sunrise service. The Hamilton Group invited the Morriston Fellowship to take the devotional in one of the churches in Hamilton some time in June. John Huether was to be the speaker for that evening. To our disappointment John was not there for the opening of the meeting. What were we going to do? However, we went ahead with the opening part of the meeting. To our relief, John walked in the door just as he was to be called on to speak. Thank goodness he did because we didn't have any back up speaker. The Youth Fellowship had their fun too, skating parties, crokinole socials, sleigh riding parties, especially one sleigh ride to Mrs. Boucher’s. Everything went very well until we were going around the Boucher pond. The horses and driver not knowing the road very well, got off the track a little bit, upsetting the box we were riding in upside down. Everyone was accounted for except Rev. Neil, who was found underneath the box, fortunately unhurt. We got the box back in place and continued on. Rev. and Mrs. Neil didn’t take the chance of riding home with us. They stayed with the Bouchers overnight. The E.Y.F. usually closed the end of May with a fun night and dinner for the summer months and opening again in the fall. When Rev. Siebert came, we introduced a new era of presenting the Christmas story. He was good at making up the different characters and dressing for the part. Another event that changed the character of the church was the digging out and finishing of the basement. Rev. Emerson Dorsch was our minister. The inspiration came from John Winer and with Rev. Dorsch’s ability to get things done the finished basement became a reality. When it came time to start the operation, a hole in the foundation was opened, midway on the southeast wall. The first vision the workers got was a great big pine stump just inside the opened hole, even with the ground level, one foot below the church floor joists. The digging began, the hole was enlarged, the stump removed and an elevator, supplied by the Huether family, installed. Bill also supplied a dump truck to take the dirt from the elevator. We had to get permission from Mr. J.H. Stewart to use his field beside the church to set the elevator and dump some of the dirt. The digging went on it seemed forever, shovel by shovel. The ground was so dry and hard. Being a clay, gravel and stone mixture, it took a lot of picking and shovelling, muscle and sweat to finish the first stage of the project. Fortunately most everyone in the community pitched in to help, including members of other denominations and also those not connected with any church. Most of the work was done in the evenings after regular working hours. Several obstacles created problems. Large stones had to either be broken up or holes dug to bury them. The foundation walls were installed, mainly by Rev. Dorsch and helped by members of the church. The cement blocks on top of the cement foundation were installed by Fred Dunkie. The trim work and the stairs from the auditorium to the basement were installed by Andy and Scotty McEdward. They also installed the kitchen framing and cupboards. Rev. Dorsch was moved to another charge the next year, fortunately most of the work was completed. Rev. Reibling who came to us after Rev. Dorsch, did the finishing of the woodwork, paneling and kitchen cupboards, with the help of the ladies of the church. The new basement contained a Sunday School Room, kitchen and furnace room. On Sunday Nov 16, 1952, the new facilities were dedicated by Bishop Balmer-Showers of Indianapolis, U.S.A. and assisted by Rev. E. F. Dorsch. A plaque commemorating the involvement of John Winer in the construction of the basement was unveiled by Edgar Boucher Superintendent of the Sunday School, John Huether, Assistant Superintendent and dedicated by Bishop Showers. My first memories of Morriston Evangelical Church began in the early 1930's. I attended Sunday School along with my cousins Bill, Joy and Dorothy Huether. My first teacher was Miss Louisa Morlock. I remember the tickets with “memory verses” on them, given out weekly. Our grandfather, John Huether was the Sunday School Superintendent then; it was a pleasure to go to Grandpa's house for lunch after church on Sunday and hear him play his grand piano. Grandpa was one of the store keepers in the village and had been the church organist at one time. He was succeeded, after his death in 1936, by John Winer with Edgar Boucher as assistant Superintendent. In my youth, I was Sunday School Secretary and Assistant Superintendent. I remember the low wood stoves on either side of the sanctuary with their long rank of pipes. Around these stoves, some of the early arrivals and some classes later gathered. They were complete with woodboxes, with hinged lids. A motto, on the front wall of the sanctuary read “Holiness Becometh Thine House” (Psalms 93:5). Until the basement was dug out (c. 1950's) the S.S. Christmas Programs, always held on Christmas Eve, were a highlight of those church years. In later youth, I helped plan these programs and direct some of the playlets and help bag up the candy treats. Two curtains were strung up across the chancel (after the rail had been stored in the vestry). I remember one of the curtains getting snagged when a play ended. I was annoyed with it getting fouled up! We had recitations - I remember one of mine was “I Want To Own A Christmas Tree Farm”. Fortunately, Dad had planted some at the back of our small acreage at Puslinch, so I felt the recitation appropriate. The Christmas decorating Committee often got the huge tree for the concert from us. In June, Children's Day Service was also a highlight of the church year. I remember many of our early ministers, many of them elderly when “stationed” by the bishop to Morriston: Rev. W.J. Zimmerman, Rev. & Mrs. J.H. Grenzebach, Rev. & Mrs. E.H. Bean, Rev. John & Mrs. Neill (retired supply from Aberfoyle United) Rev. & Mrs. J.E. Bender, Rev. Wesley Seibert, Rev. Emerson & Ada Dorsch (student minister), Rev. N.H. & Mrs. Reibling, myself (as student), Rev. & Mrs. G.L. Gross, Rev. & Mrs. A.S. Caughell and Rev. & Mrs. William Durst. Many of those listed earliest served communion in the pews - folks moved to every other row. Some later ministers had everyone come to the front and served them there. The Evangelical (1922) and Evangelical United Brethren (1946) had no lay elders. I remember holding a Maunday Thursday Communion Service (April 7, 1955) around a table at the front. During my student days I seemed to have had a special dispensation to serve Communion! As student pastor, 1954-56, we continued Easter Sunrise service and breakfasts. While I was a student minister, I was privileged to attend the Baptist World Alliance in London England in the summer of 1955, and to travel on to Europe and the Holy Land. During my five-week absence, laymen from James Street Baptist Church in Hamilton conducted the services at Morriston. Mr. Stan Wharton, with whose family I boarded in Hamilton, while attending McMaster University arranged this. On my return from the trip, the Morriston Congregation presented me with a slide projector. During my ministry, my aunt Mina, Mrs. A.J. Huether, was the lay delegate. Rev. W. E. Beese retired and moved to Morriston about this time and attended church here. Martha Debo was often soloist at the church during my ministry and beyond served as church caretaker. It was my privilege to attend camp at Paris (Camp Thayendanegea, forerunner of Five Oaks) and many Young People’s Conferences in Kitchener, New Hamburg, Stratford, Elmira and Golden Lake. I was also active in the Christian Endeavour Society during Rev. Wes. Siebert’s ministry (1946-47) where I served as one of the program director’s (Recreation). The Young People’s Society of E.Y.F. (successor to E.L.C.E.) met Friday nights in the church vestry. Occasionally we would have skating parties on the Morriston Pond, behind the church, also tobogganing parties. The annual “banquet” in the spring, closed off the season and it was often re-opened in the autumn with a corn or weiner roast. Our joint Good Friday evening services alternating with Duff’s and Crieff, Aberfoyle and Freelton-Strabane, were memorable. We must not forget the enjoyable Sunday School picnics - often we went in the back of a stake, farm truck (Greer’s, Winer’s) to such places as Riverside Park, Guelph; Soper Park, Galt; Puslinch Lake; Fairy Lake, Acton and Erindale. It was at Puslinch Lake that some of our parents nearly died of concern at us out in the lake in a punt! At Acton, I nearly drowned while trying to learn to swim. I never did learn to swim! The music at Morriston Church depended on Miss Morlock pumping the treadle organ and leading the choir. With Mrs. Minnie Durnin’s lusty, contralto voice in the congregation we were a praising group! During my ministry, Louisa Morlock retired as organist and Mrs. Chalmers used the piano, until more recent years when the organ returned to prominence. In the 1940's we were often invited to the parsonage (manse) next door, for a sing song at the Neill’s, after evening service. When one became 11 or 12 years, we boys were allowed to sit by ourselves in the back seats. When the sermons turned dull, a few cartoons found their way into the back of the hymn books. There were no bulletins except on special occasions. These are just a few impression of my early days at Zion E.U.B. church, Morriston, now Mt. Carmel - Zion United Church. That was a lovely afternoon when dear Mr. and Mrs. Wm. (Bill) Durst came to call. It was always a pleasure to see them. The men would then discuss the things that men talk about and Mrs. Durst and I would have a nice little chin-wag. Of course, I'd serve tea and cookies. Then we would set off for a walk around the pond. Blackie and Heinz, the two faithful dogs came along as usual. Heinz, the three coloured dog (57 varieties) would stay close to us, especially to me, for he did not trust strange men near his mistress. Blackie would scamper all over the place. On the other side of the pond, my husband Jim and I had built the little cabin. Needless to say the sanitary facilities were some distance away in the bushes. Just a one seater, built from the lumber of the old slaughter house, which the Finkbeiners had erected many long years ago when the land still belonged to Edgar and Elsie Boucher. The rental apparently was paid for in meat. You could still find animal bones, bleached white, among the bushes and the long grass. As we were strolling along, Mr. Durst remarked on how far the perfume of that outhouse carried. We felt a bit embarrassed, we had never noticed anything of that nature before, so far from the site of crime. Yes, come to think of it, it really was strong, getting stronger as we walked along. And then, my husband, Jim chanced to turn around and there was dear little Blackie dragging a very dead groundhog along. We could now again concentrate on the beauties of nature and amount of work we had done to clear the land around the pond. At that stage, Mr. Durst told us about a pastoral visit to a pioneer farm and how the minister remarked on the wonderful work of the Lord. The pioneer said “but you should have seen the place before I gave him a hand”. A wonderful visit, on leaving, they left a warm glow. Today, the church carries on in the same faith in which it was founded. With the demands of the world today, each does what they can. There are regular Sunday morning services and a Sunday School which closes for the months of July and August. The ladies, no longer known as U.C.W., meet for worship and take care of the church’s physical needs. A fall “Harvest and Holly” bazaar is held each year, which is a great opportunity for fun and fellowship. There is also a small but active mixed choir that offers some form of musical interlude each and every week. The men are a very active “bunch”. They do not have an organized group, but are very busy from adding a family room to the manse, to building display cases, to holding a spaghetti supper. The one weak spot is in the Youth Group. So many pressures are placed upon our young people today, but we pray that as they mature, they will be very capable leaders within the church in the years to come. talent and monies have been received. for all the gifts which have been given. We offer our sincere thanks! !